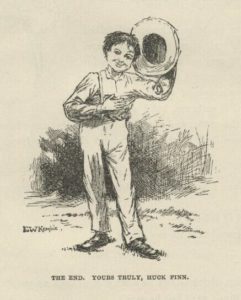 In recent years Finn has been removed from reading lists for its copious use of the N word, though Twain was portraying a slice of 1840s America in order to expose and shame its prejudices. But this is not a post about that controversy. The interested reader can find a good overview of the dispute in this article. In the middle of the novel Huck has the opportunity to turn Jim over to some slave trackers, for a reward. In the culture Huck is part of this is the “right” thing to do. A slave is someone else’s “property.” Thus, helping Jim escape is stealing. And since stealing is agin’ the Good Book, Huck is in danger of hellfire. So he’s been taught. But something makes Huck hesitate. He tells the trackers that he and the fellow on the raft (Jim in hiding) have small pox. The trackers make a quick exit. So here is Huck asking himself who he is, who he is supposed to be, and deciding for the moment that the best thing is to just not think about it. But he’s teetering toward a transformation of some kind. He doesn’t have the capacity (yet) to completely understand what’s happening inside him. But we know whatever it is it’s at the heart level. I’d see him standing my watch on top of his’n, ‘stead of calling me, so I could go on sleeping; and see him how glad he was when I come back out of the fog; and when I come to him again in the swamp, up there where the feud was; and such-like times; and would always call me honey, and pet me and do everything he could think of for me, and how good he always was; and at last I struck the time I saved him by telling the men we had small-pox aboard, and he was so grateful, and said I was the best friend old Jim ever had in the world, and the only one he’s got now; and then I happened to look around and see that paper. because I’d got to decide, forever, betwixt two things, and I knowed it. I studied a minute, sort of holding my breath, and then says to myself: ‘All right, then, I’ll go to hell’—and tore it up. That’s how you make a classic. A moral dilemma, a mirror moment, a crisis of conscience, a final decision, proof of transformation, and a resonant last line. But, truly, these things can be done in any genre, and will elevate any book. There is plenty of competent fiction out there. But why settle for mere competence? I’m sure each of you can recall a powerful, transformative ending in a book or movie, one that you’ve never forgotten. Tell us about it. This entry was posted in Transformation and tagged Huckleberry Finn, Mark Twain, write your novel from the middle by James Scott Bell. Bookmark the permalink. Jim, it’s been probably 60 years since I read the novel, and I may be confusing novel and movie, but isn’t there the kind of scene you’re talking about in _The Bridge Over the River Kwai_? That’s a book I really should read, since I’m such an Orson Welles fan. Hi there. I hadn’t thought much of the mirror moment, but I do have a question now I find I’ve stumbled upon my character’s moments in my existing story, seemingly by chance. My story concludes with her discovering her reflection in a glass door at a nursing home where she takes baby steps back into her rural community (with people who won’t remember her shame) some 60 years later. “Not bad for an old girl.” She says of herself. As I said, it seems I’ve created a recluse’s mirror moments organically. And they really are captured in mirrors! My question is: these moments occur at about 5% and 95% in my novel . Is there an ideal time for these moments? Obviously there’s a lot of story in between that drive her towards this, so it makes sense to me. Thanks. I love this blog, a recent discovery. That sounds powerful, Jay. For what I’m talking about, the organic spot for THE mirror moment (literally or figuratively) is at the halfway mark. That’s the perfect spot to clarify the stakes and set the stage for moving into Act 3 and the final battle and transformation. Not that there can’t be naturally occurring inward moments before. You know what movie is like this (and like your novel?) It’s Now, Voyager with Bette Davis. I analyze it in my book. Jim, thank you for another great lesson. Your line about how you make a classic is a perfect summary of a great and engaging read. Perhaps the structure resonates because it mirrors our own lives, those moments when we face our own dilemmas that drive us to decision and transformation. Thanks again. There’s a lot to that, Mark. Our daily lives have a three-act structure, and in fact our whole life, too. Remember the riddle of the Sphinx? What walks on four legs in the morning, two legs in the afternoon, and three legs at night? My all-time favorite is the end of It’s a Wonderful Life when everyone George helped all his life comes to help him. Thanks for the reminder. Yes, that shows exactly who George is. Thank you for the How to Create a Classic list above. It’s in my writing journal. You’re a great teacher. Working on my (hopefully) future classic right now. One of my favorite scenes from the best movie of all time. Thanks for such a great mirror moment example with your analysis of Huck Finn. Adding your book to my study list so I can improve that aspect of my WIPs. The Mirror Moment is the part I have focused on since I was lucky enough to discover your book several years ago. The Huck Finn example just reinforces the beauty of your message. Thanks, Nancy. So glad to hear it’s helped! Karl Jung’s shadow double or twin has always informed my writing of the mirror moment. Another character embodies either what the main character most wants to be or most despises in himself, and he must make the realization of who he truly is and rebuke or defeat that twin. In a really strong mystery, the main character and his antagonist are a yen and yang where the main character defeats the antagonist and his own weakness/darkness. Good luck with your book. It sounds great. That may be true about Holmes/Moriarty, but I’ll leave that to the Jungians. Thanks for the good word. Thank you for such an interesting post! I have been using the Three Act Story structure, but some of the points were hard for me to nail down. You answered several of my questions in this post and I know the book will answer more, so I just snagged it off of Amazon. Now I am going to go back through some of my early works that have been nagging me about not being quite “There” yet. Although, I do have the mid point, the big event setting up climax where the MC goes on offensive -emotionally or physically, I think the mirror moment defines it better for me and I believe I can set up my ending with a lot more impact. Cecilia, I’m so glad to hear that, and I think you will find it’s true. I hear that a lot from writers. Carry on! And now I know why Huckleberry Finn was my favorite book when I was a kid. Back, then, I just liked Huck. I purchased Write Your Novel From The Middle: . . . three or four months ago, but am just now reading it. When I realized what you are saying, I went back to my own work to look to see where my mirror moment is in one of my own novels. It’s there. It’s just not quite in the exact middle. But there is no doubt: everything before it goes to there; everything after it comes from there. Everything I wish to write in the future has suddenly fallen into place, knowing now what you have taught us. Jim, thanks. I realized this for myself and tested it before writing thr book. I get a lot of comments like yours. It pleases me enormously! I can’t believe that Write Your Novel From The Middle: A New Approach for Plotters, Pantsers and Everyone in Between is less than a buck for the Kindle version. That’s practically free. Grab it, folks. This is a no-brainer.